There is some crossover here from the Ocean Reef disc, but with more tracks and different takes, and a better cross section of sounds. A lot of this material can be likened to Man or Astro-MAN? in that it's hard driving, guitar driven, and riff oriented as opposed to melodic. Vocals here include Johnny Kidd and the Pirates' "Please Don't Touch," "Uranus is a Planet," the Ramones' "Rockaway Beach," and a live take of the Trashmen's "SurfinÕ Bird." Fans of MOAM, garage surf or frat will appreciate this Dutch band. The classic "Intoxica" shatters the night with a frat party surf rant arranged as the Apemen did it. Big and intense, and a real party slammer. A siren and tribal drums, and a relentless nonmelodic nerve wracking guitar assault a la Man or Astro-MAN?. 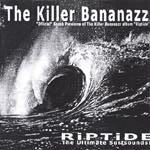 Thrashy surf and slam garage rage, chords and progressions augmented with glissandoes, but not much of a melody. "I Can't Surf" is a near-rockabilly based number with speed and power, and a choppy attack. Not exactly melodic, but with an interesting riff and lots of intensity. The Chantays' "Pipeline" is played in the Lively Ones arrangement, with trumpet and harsh energy like a sped up Johnny Thunders. I think it's the trumpet that keeps this from being just another cover. Solid, if not inventive. Jerry Lordan's classic "Apache" (1961) is treated to a modern intense guitar tone and tribal drums, giving it a more biting edge and bigger whammy effect. Pretty cool. The Original Surfaris' surf monster "Bombora" is trashed like there's no tomorrow, with big power and string attacks. Groovy and mean.